File classifications are for storing bibliographical information about your files—you can import this information from reference management tools like EndNote or Zotero. 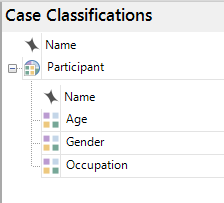 NVivo provides predefined classifications like interview and focus group to help you keep track of your files—you can add these to your project or create your own general classifications. 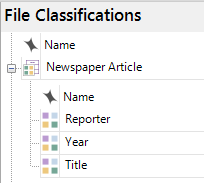 Add any of NVivo's predefined bibliographical classifications—if you intend to use a reference management tool to format your references later on. When you import web pages or import content from Evernote or OneNote, the files are automatically classified as 'Reference'. 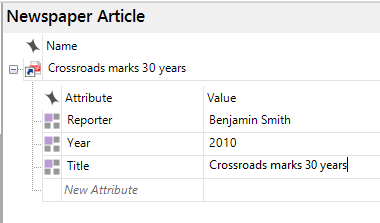 Attribute values—for example, the URL and title of the web page—are assigned. 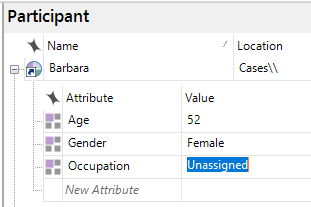 In Navigation View, under Codes, there is a folder for relationship types—relationship types are a special type of classification. Relationship types describe the nature of a relationship (node) that occurs in your project. For example, you could set up a relationship type married and another relationship type lives with. Unlike other classifications, relationship types do not have attributes—when you create a relationship type you need only define the direction of the relationship (associative, one-way, or symmetrical).